Larry Cuban recently posted a commentary on MOOCs about three years after their introduction into the education hype machine, and offers three reasons why they will not revolutionize higher education. All are good observations but I think number two also explains why they and other mass teaching platforms won’t revolutionize K12 schools. The fundamental error in policymaker thinking is that teaching is solely delivering subject-matter to students. There is far more to teaching that content delivery such as creating a learning culture in the classroom, organizing lessons involving students in tasks that build understanding of what is supposed to be learned, and applying and practicing newly-learned knowledge and skills. There aren’t many K12 MOOCs (yet) but we still have any number of highly-lauded subject-matter delivery systems promoted by billionaires and politicians, like Khan Academy, that are also neither revolutionary or effective, and do little or nothing to build a classroom learning culture. Do You Have To Lecture Me? In a recent post, Larry Cuban offers a compact andÂ interesting overview of two instructional mainstays, used by teachers for millennia: lecturing and questioning. And he believes both will be around for centuries more to come. I would question his “one enduring function of schooling”, but that’s something to rant about another time. When it comes to lecturing, the people who are best at it go far beyond just transmitting information. Â They weave stories, entertain, and inspire. They are the people who deliver keynotes at conferences, offer motivational seminars, present TED talks, and sometimes give political stump speeches. Unfortunately, far too few of the really good ones are teaching in high school and college classrooms. And, when it comes to lecturing as teaching technique, I’m not sure the technique has ever been all that effective for learning. Although Cuban only fleetingly mentions the impact of evolving technologies over the centuries, the tools developed in just the past decade or so have dramatically decreased the necessity of using lecture for instruction, certainly in high schools. The best presentations by those best lecturers can be easily archived and used by anyone in any class setting. More importantly, those with something to say but with other skills can create compelling video and audio programs that convey information even more effectively, and entertaining and inspiring at the same time. Cuban is probably right that the use of lecture as a teaching technique will probably continue long past the time we’re talking about 22nd century skills (which will probably start any day now :-). However, with any luck, it will be increasingly confined to only those who do it well, while the rest of us develop our capacity to inform and communicate using the many and growing number of other instruments available. 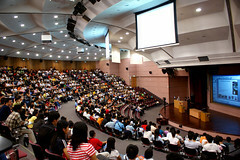 Image: That Huge Lecture Theater! by teddy-rised on Flickr. Used under a Creative Commons license. What happened to the revolution that was supposed to occur when we flooded classrooms with computers? If ICT [information/communication technology] means the use of computers in schools and classrooms and if learning means what academic content, skills, and behaviors students can perform in and out of school, then the massive investment over the past 30 years in wiring schools, buying computers and the latest hand-held device has fallen far short of being a “revolution” in students’ learning and teachers’ teaching. While not a fool’s errand—the idea that ICT would revolutionize schooling was, at worst, sloppy thinking and, at best, ardent wishfulness. That’s the opening paragraph to aÂ recent post by Larry Cuban, part of a larger debate under the title “Are ICT investments in schools an education revolution or fool’s errand?“, and it basically summarizes some of the thoughts on the subject I’ve had increasingly over the past few years. Our use of technology in schools has not only fallen far short of a revolution, much of the billions we’ve spent has been wasted. Here in our overly-large school district we’ve devoted a large chunk of change to purchasing technology over the past two decades and, although some of our administrative processes have been altered as a result, the fundamentals of instruction have not. Walk through almost any of our schools on an average non-testing day and you’ll need to look very closely to see any evidence that technology has made an impact (or that ICT is being used at all). Indeed, what few traces you do find are in the halls and corners where students are using their hand-held devices to connect with friends, update their Facebook pages, and do research… on whatever currently interests them, not necessarily topics assigned by their teachers. Classrooms, especially in middle and high school, are still largely arranged in the same manner they were fifty years ago with the teacher, largely in lecture/demo mode, in complete control of the instructional process. I said “non-testing day” above because that’s when the computers are most evident, and possibly the only time in most schools when we have a true 1-1 program. We have a major push for computer-based testing in our schools, driven by the fact that the state wants to gather all test results electronically (cheaper and faster to report scores), and the sparkling new electronic assessment system (re: online test prep) our district is building. The only reason why some schools are buying netbooks is because their dollars will buy more devices on which to administer “common” assessments and other standardized tests. It’s all rather sad. We have inexpensive machines and networks that offer access to the world for our kids, and instead use them for a mundane process that does little to foster learning, and nothing to encourage curiosity, creativity, and understanding. Instead of a revolution, we get a Leave it to Beaver classroom with electronic bubble sheets. Over the past couple of decades, how many times have we heard politicians, corporate leaders, and other education “experts”ï»¿ declare that we should be running schools more like a business? That’s the concept Larry Cuban addresses in a recent post in which he asksÂ What Do Corporate Earnings Reports and School Test Scores Have in Common?. His basic observation is that, under pressure to improve their score card, both companies and schools frequently change their practices to favor the short term bottom line instead of building for long term strength and growth. Sometimes, as we’ve seen all too often in recent events, through unethical and illegal methods. However, even worse is the fact that both earnings reports and test scores offer a very incomplete, and usually misleading, picture. Just as earnings statements are too narrow a measure of corporate performance, test scores barely cover what students are expected to learn in schools. Civic engagement, knowledge of the humanities, building moral character, working in teams, critical thinking, and independent decision making — historic aims of public schools — are missing from standardized tests. Moreover, if earnings reports mislead investors as to the actual worth of the firm, standardized test scores mislead parents about the actual performance of their children. And so we have, as Cuban points out, the irony of “business leaders pushing onto schools narrow and misleading measures of student performance while harboring their own narrow and deceptive measures”. Unfortunately, those business leaders just don’t get the irony. Why Are We Buying This Stuff? In parts one and two of a multipart post, Larry Cuban looks at why school districts buy new technologies when there is little or no evidence they do anything to improve student learning, especially when most are having major budget problems. From part one, he notes that consumer spending on electronics in the US is up despite the continuing recession. At the same time schools are purchasing more technology products while also laying off teachers, increasing class size, and cutting program. Economists can probably tell you why families are devoting scarce resources to new and better technology devices but why are schools doing the same thing? Where is that “solid evidence”? The evidence for these electronic devices doing what is expected both in the U.S. and abroad is–as I read the research—at best, spotty–at worst, weak. Few careful and impartial observers of U.S., Europe, and Asia where governments have committed themselves to infusing technology into schools can say with confidence that the use of new technologies has led to increases in student academic achievement (as measured on either U.S. or international tests), altered substantially how teachers teach, or prepared students for to compete in an ever-changing labor market. In part two, Cuban offers two reasons for this blind devotion to tech “solutions” that solve nothing: political and psychological. This political explanation helps to make sense of why policymakers effortlessly skip over the lack of evidence to support major high tech expenditures. They figure that media photos of students happily clicking away on laptops—visible symbols—will trump the few research studies or critics who question purchases. Turning from a political to a psychological explanation, districts buy technology because they suffer from “inattentional blindness”: They are too focused on a specific problem and lose sight of the big picture. Or they suffer from some kind of blindness caused by salespeople promising tech-based “solutions” to whatever problem their schools might be facing without seeing if it fits in that big picture. Of course, if the stuff looks good when photographed next to the superintendent, mayor, governor, and/or congressional candidate, so much the better. Cuban, as always, makes some excellent points about our educational obsession with gimmicks. Â Take the time to read both posts.